Many Americans are now going to fitness centers over yoga studios to practice a new kind of mind-body workout known as Integral Strength Training. 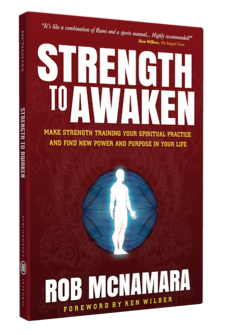 In his heady new book Strength to Awaken, performance coach Rob McNamara shows athletes and fitness enthusiasts how to use an integrative approach to strength training to transform working out into a spiritual practice like yoga, and experience major performance enhancements in all areas of life. 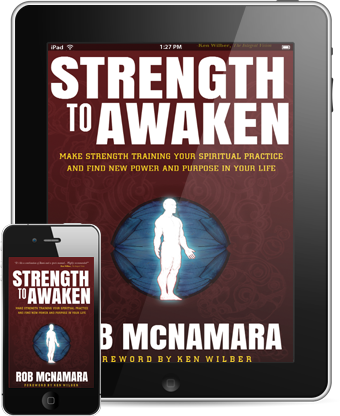 Robert McNamara’s approach to resistance training, as described in his book Strength to Awaken, is grounded on integral principles… and he views muscle building as a spiritual discipline. On his Embodied. Evolution. blog, the author explains why people over the age of 22 to 24 need to build muscle. 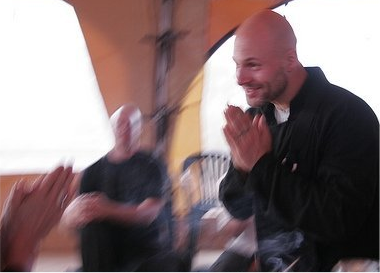 Rob McNamara is a psychology professor, zen practitioner, and strength trainer who works at the intersection of strength training and contemplative practice. In this episode McNamara explains how his experiences in the gym helped him understand the purpose of meditation, and how both inner and outer strength are deeply intertwined. He describes how strength training can stretch both the upper and lower boundaries of the ego, helping us learn how to not check out when things get uncomfortable, nor space out when we have an opportunity to relax deeply and let go. How much exercise is required to build strength and feel great? In part two of our conversation, Rob lays out a simple and straightforward plan to build high-performance strength. The good news: Rob says we can do it in under 3 hours a week. Rob highly recommends Shawn Phillips’s new book, “Strength for Life,” as a great resource for getting started on a program like this. Rob goes on to talk with us about Full Strength, a meal replacement product developed by Shawn Phillips that has been clinically shown to produce positive results in muscle building and fat and cholesterol reduction. A recent clinical study at the University of Oklahoma confirmed the wisdom that went into the production of Full Strength and documented surprisingly positive health benefits to the participants. TNM 022: Rob McNamara Pt 1 – What is Strength?